Exterior primer is, in essence, a specially formulated paint that seals over the wood (or whatever material you’re painting) and creates a nice, even foundation for the finish coats of paint (called top coats). Exterior primer formulations can include a range of additives, such as stain blockers, mildewcides and UV inhibitors. The best product for your house depends on the materials you’re painting and general condition of the exterior surfaces. Find out more. In other words, use exterior primer unless you’re dealing with a previously painted surface that’s in very good condition and wears finish that’s compatible with the new paint. As mentioned, exterior primer can provide many benefits, but its primary job is to stick. Just as a chain is only as strong as its weakest link, a paint job is only as well-stuck as its primer, the only connection between the paint and the underlying surface. So, first and foremost, choose an exterior primer that’s formulated to stick to your house material, whether it’s bare wood, fiber-cement, vinyl or anything else. For all masonry surfaces (brick, stucco, concrete block and poured concrete), be sure to use an appropriate masonry primer/sealer. These tend to be more permeable than other primers, allowing moisture from within the masonry to escape without peeling off the paint. Mildewcide, UV inhibitors and other additives are recommended for specific problem areas, such as house sections that receive too little—or too much—sun exposure. For unpainted siding and trim made of redwood, cedar or a similar species with high tannin content, choose a good stain-blocking primer to prevent bleed-through from the wood as it ages. Just as with exterior house paints, today’s water-based exterior primers have become the standard and perform as well as or better than their oil-based counterparts in most applications. Quality latex primers contain a high percentage of acrylic as a binder, or glue, in the mix. The higher the better: Most premium exterior primers are made with 100% acrylic binders. To give traditional oil-based exterior primers their due, many pros prefer oil-based primer or sealers for blocking stains and bleed-through with redwood and cedar, while many others have switched to good acrylic latex primers with stain-blocking additives. To help you with the decision, a well-established paint retailer can tell you which products will work best for your surface and, just as important, for the paint you’ll use over the primer. 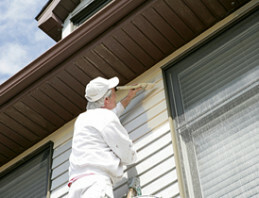 Contact a reliable contractor for professional exterior priming and painting.